NEW HI-PERFORMANCE SMALL BLOCK CHEVY SMALL CAP HEI DISTRIBUTOR, 50,000 VOLT COIL & 8MM SPIRAL CORE SPARK PLUG WIRES THAT ARE MADE IN U. Brand New Small Block Chevy Small Cap HEI Distributor. This distributor is also know as a Ready-To-Run distributor. This distributor requires an external 12 volt coil for electronic ignition and it is included in this listings. Distributor works on Small Block Chevy 265-283-302-305-307-327-350-400. If you want this distributor & spark plug wires set without a coil, please check out my other listings. All the items in the package are RED as shown in the photo. I also have the distributor available in Black or Blue. The Wires are also available in Black or Blue. Finally the coil is also available in Black or Blue and are 50,000 volts and I also have a 40,000 volt Chrome Coil Please see the second photo above that shows different coils available. I have the distributor in Red, Blue or Black. I also have this same electronic distributor with a female (points style) cap. It has the classic "Points style" look, but is completely electronic. The female cap style distributor and wires are both available in Red, Blue or Black and the coil is chrome. Please send us a message if you are looking for the distributor with the female cap. PLEASE NOTE: YOU MUST RUN EXTERNAL COIL WITH THIS DISTRIBUTOR and it is included. Coil needs to be 12V and have an output of 40,000 volts or more. This Small Cap HEI Ready-To-Run distributor is made for easy installation. Just hook up the two wires and you are "Ready to Run"!! Small Cap allows for easy fire wall clearance, especially for Pre-1975 that do may not have the room for a large size HEI. OEM appearance (also available with female cap). Unit is fully CNC machined. Fully self-contained distributor with built in Module. Only requires 12 volt External coil for electronic ignition (Typical points coil will not work). No Ballast Resistor is required. Easy two wire Hookup (wires included). Same as late GM HEIs except you run an external coil instead of In-cap coil. Eliminates the need for all the extra wiring and ballast resistor. Major improvement in starting and performance over points. Built-in GM style module (not made by GM). Spark plug gap can run from around 45-50 instead of 35 if you run points. Same size as the original points distributors and is fully electronic. Far less pollution, as the fuel is burned much better. Faster start ups, especially in cold weather. Those with carburetors prone to flooding will notice a huge difference, as the spark on electronic ignition is many times stronger than point style ignition. Virtually no maintenance, compared to points. Spark plug life is 3-5 times longer, as well as plug wires. Much better performance, over points, mostly due to the better combustion of unleaded fuel, as this was the primary reason for the development of electronic ignition. Point dwell changes as points wear out, causing your timing to advance dramatically. This brings your engine much closer to detonation, not to mention hard starting, and poor performance. Over all engine life is much longer with electronic ignition over points. This listing also includes a New RED 12 Volt coil that puts out 50,000 volts. This is a perfect coil to run with this electronic distributor. This listing also Red PACKARD WIRE 8mm High Performance Spiral Core Spark Plug wires for Small Block Chevy applications. Spark plug wires have 90 degree spark plug boots and 90 degree distributor boots that are already factory assembled. The wires are only 270 Ohms per foot and made in the USA!! The lower the ohms, the higher the performance!! The included set of RED wires will work on SMALL BLOCK CHEVY (up until mid 1980's) with 265-283-302-305-307-327-350-400 engines using the HEI (male tower) distributor that is also included in this listing routing the wires over the valve covers. These wires are already factory assembled for these engine sizes so you DO NOT cut and crimp on the distributor ends. This set DOES include a coil wire! PACKARD WIRE 8mm High Performance Spiral Core Spark Plug Wires have a resistance of ONLY 270 Ohms per foot. Next, choose a topic from the list provided. Some common questions and answers may be shown. We are a family business and your satisfaction is critical to our success. Your questions are answered by owners of the company. All descriptions are provided accurately to the best of our knowledge. While all care is taken, any errors or omissions in the item details are unintentional. We are not mechanics but will assist you to the best of our abilities (or forward you to one of our support representatives). These charges are the buyers responsibility. We cannot mark merchandise values below value or mark items as gifts US and International Government regulations prohibit such behavior. Any product which has been altered in any way, improperly installed, or not used for its intended purpose. Any costs associated with the repair or replacement of the product including labor, installation or other costs incurred by the purchaser, and in particular, any costs relating to the removal or replacement of any product that is affixed to another devise. Any damage to the product due to external causes, including accident, problems with electrical power, abnormal electrical, mechanical or environmental conditions, usage not in accordance with product instructions, misuse, neglect, alteration, repair, improper installation or improper testing. THOUSANDS OF POSITIVE FEEDBACKS (100%) since March 2000! 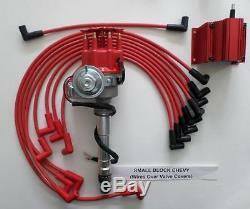 The item "SMALL BLOCK CHEVY RED Small HEI Distributor, SPARK PLUG WIRES Over Valve Covers &" is in sale since Monday, July 08, 2013. 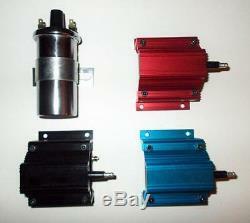 This item is in the category "eBay Motors\Parts & Accessories\Car & Truck Parts\Ignition Systems\Ignition Wires". The seller is "theswapmeetparts" and is located in Barnegat, New Jersey. This item can be shipped worldwide.